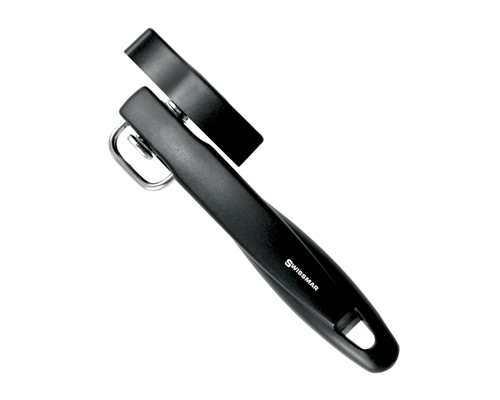 The SwissMar Rim Walker Style Can Opener safely cuts the outside of the can leaving no sharp edges. Comfortable grip with fluid turning mechanism. 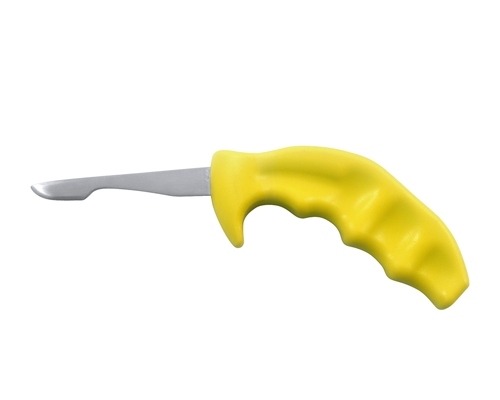 The Swissmar Micro-Serrated and Fine Peeler Duo comes with two peelers - one micro serrated and one scalpel. We like the micro-serrated version for the bulk of your work. It easily grabs the vegetable skin and can cleanly peel even a ripe tomato. However, the very fine lines from the micro-serration are visibly on the peeled produce. In some cases, say a fruit tart for example, this may be undesirable. In these instances, the fine scalpel blade is preferable. 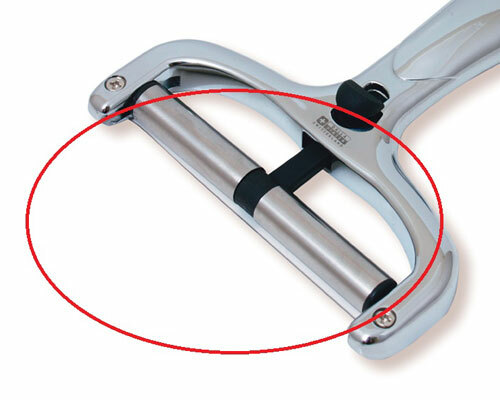 Very thin smooth slices from this peeler also works well for shaved Parmesan. 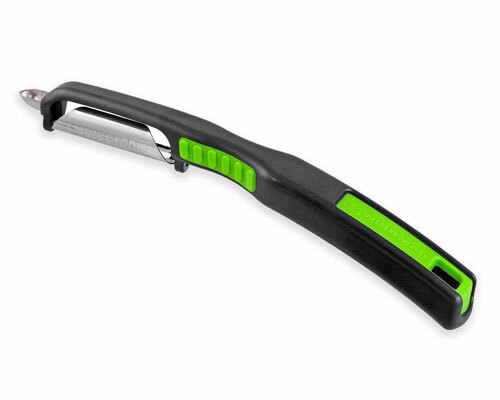 Swissmar SwissCurve Straight Peeler in Black and Green has a patented curved stainless steel blade with a non-slip handle. 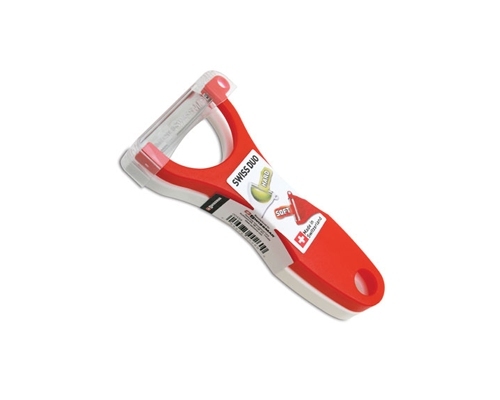 This peeler is designed to direct peels away from what you are peeling to alleviate the mess peeling generally causes. Swissmar SwissCurve Straight Peeler in Black and Red has a patented curved stainless steel blade with a non-slip handle. 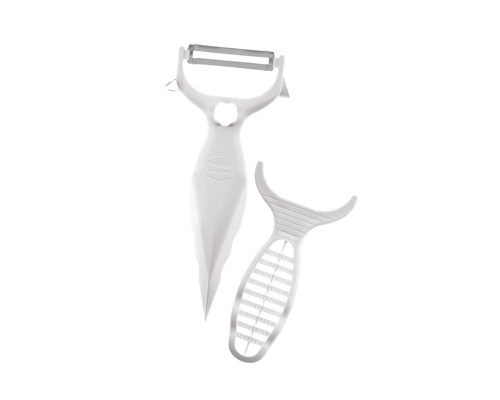 This peeler is designed to direct peels away from what you are peeling to alleviate the mess peeling generally causes. 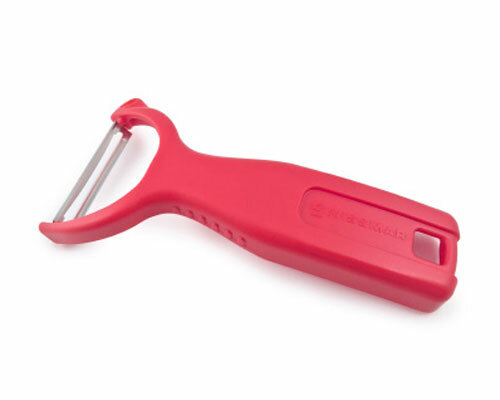 The Swissmar Red Swiss Peeler has a Y shaped blade that is extremely sharp. Mainly used on hard fruits and vegetables, but can also be used to shave hard cheeses and chocolate. 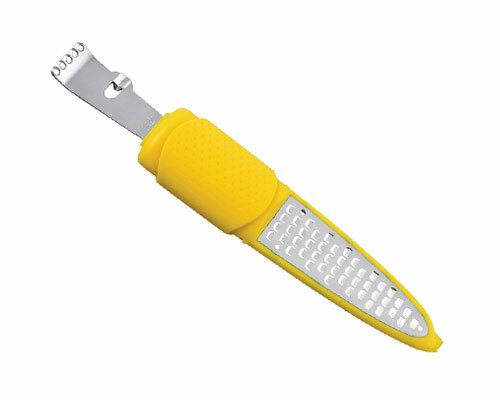 Swissmar Swissentials Citrus Zester/Grater combines the 2 most used tools in one for food decorating and garnishing. 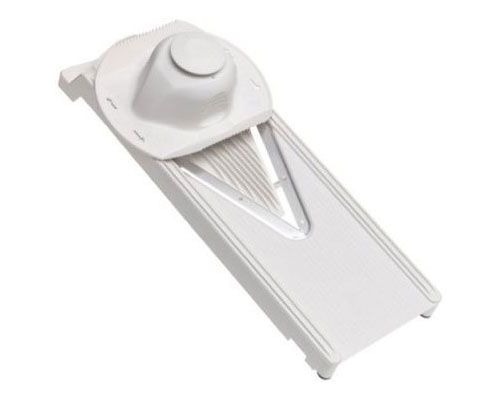 The zester can be used on fruits like lemons, limes and oranges while the grater can be used for grating hard cheeses, but also strong enough to grate cinnamon, nutmeg, coconut, etc. Constructed with a razor sharp stainless steel and plastic housing. Comes with a protective cover. 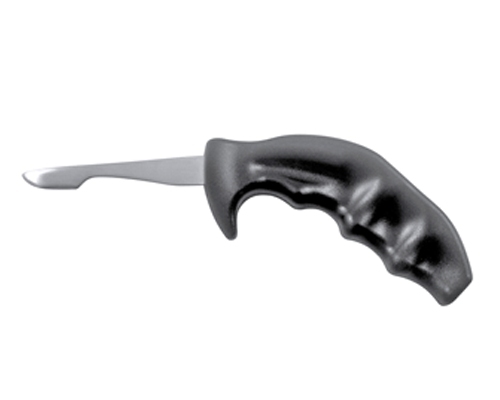 This knife tip slides nicely into any oyster, and the unique handle allows you to pop the shell with a flick of the wrist. I usually am unhappy with the appearance of an oyster due to the top cut. So, I remove the lower abductor and flip the oyster over for better presentation. Not necessary with this shucker. No more cut knuckles and really fast. 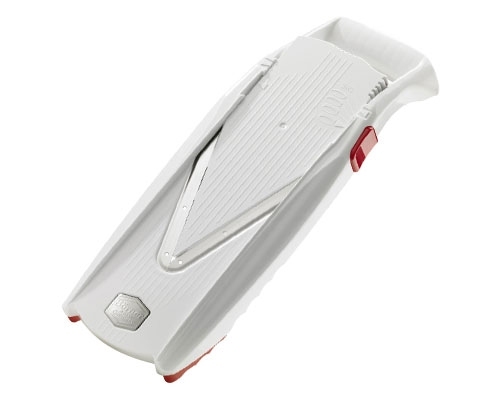 I know it looks strange, but I promise that you are going to love this oyster shucker. 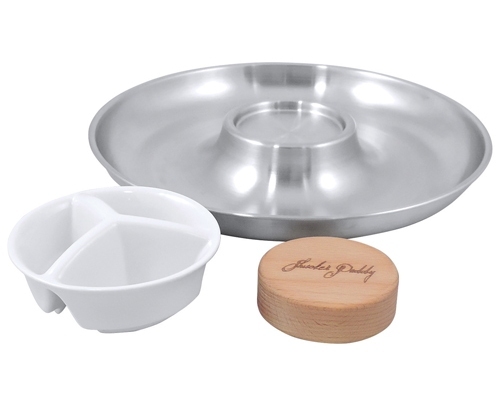 The SwissMar Oyster Tray Set features a stainless steel tray, a ceramic dish for sauces that goes in the middle, and a wooden hockey puck for shucking on. 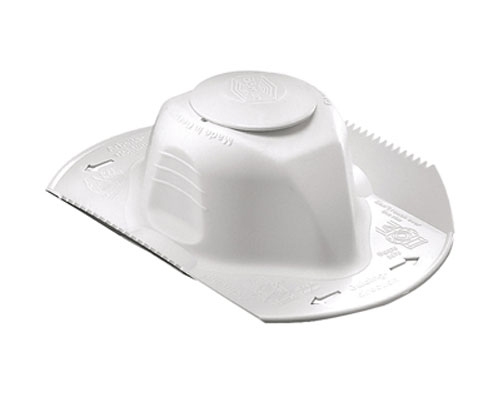 The Swissmar Veg' Art Prep Tool is a handy 6-in-1 tool that performs many important kitchen functions. Use the end to create decorative cuts in fruits and vegetables or core tops off of strawberries and tomatoes. Open and peel citrus without all of the mess. 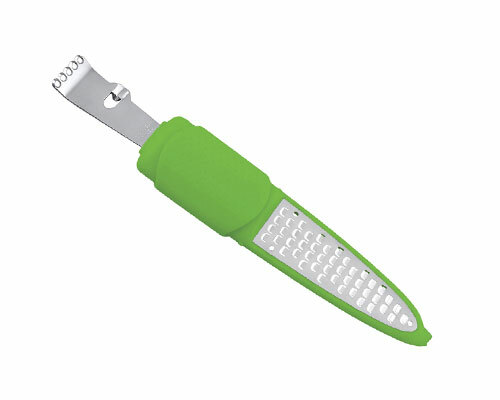 Use the snap-on grater for garlic or nutmeg. The high quality German stainless steel blade is durable and suitable for most fruits and vegetables.